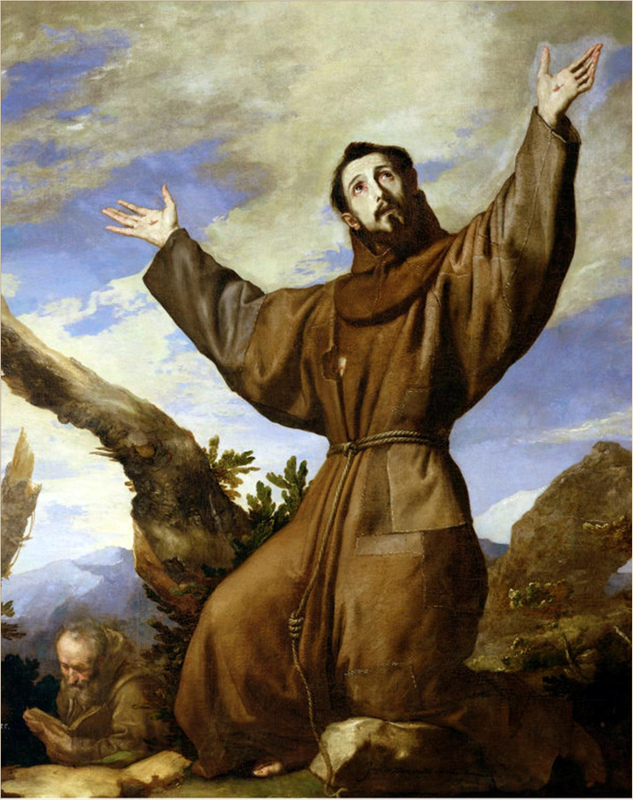 Today is the feast day of St Francis of Assisi, without doubt one of the best known and best loved saints of all time. He is probably most frequently remembered as a lover of animals, and because he is the patron saint of animals, his feast day was chosen in 1931 as World Animal Day, which is now celebrated internationally as a day to focus on a variety of issues concerning animals and the environment. As with the lives of all medieval saints, the facts of Francis’ life and fantasy are inextricably entwined to the point that the strands are almost impossible to separate. Let us just say, therefore, that what follows is a good story with a firm spine, including the fact that Francis lived a simple life of poverty devoted to the care of others. Francis was born in 1181 or 1182, one of seven children, to Pietro di Bernardone, a prosperous silk merchant, and his wife Pica de Bourlemont, about whom little is known except that she was a noblewoman originally from Provence in France. Pietro was in France on business when Francis was born in Assisi, and Pica had him baptized as Giovanni. When his father returned to Assisi, he took to calling him Francesco (“the Frenchman”), for reasons that are not clear, perhaps simply in honor of his mother. It is said that as the son of a rich merchant Francis lived an indulgent and dissolute youth, dressing well, and living the high life while working in his father’s business. In 1201, he joined a military expedition against Perugia and was taken as a prisoner at Collestrada, spending a year as a captive. It is possible that his spiritual conversion was a gradual process beginning with this experience. Upon his return to Assisi in 1203, Francis returned to his carefree life but in 1204, a serious illness led to a spiritual crisis. In 1205, Francis left for Puglia to enlist in the army of the Count of Brienne. However, a strange vision made him return to Assisi, deepening his ecclesiastical awakening. It is said that on his return home he ceased his wild ways and instead spent his time in lonely places, asking God for enlightenment. He also took to nursing lepers in the lazar houses near Assisi. 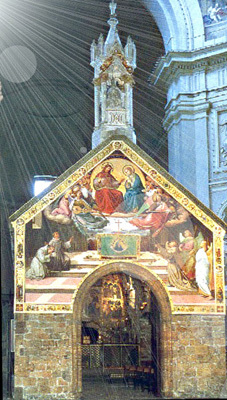 After a pilgrimage to Rome, where he joined the poor in begging at the doors of the churches, he wrote that he had had a mystical vision of Christ in the country chapel of San Damiano, just outside of Assisi, in which the Icon of Christ Crucified said to him, “Francis, Francis, go and repair my house which, as you can see, is falling into ruins.” At the time he took this quite literally to mean the ruined church in which he was presently praying, and so he sold some cloth from his father’s store to assist the priest there for this purpose. His father, Pietro, highly indignant, attempted to change his mind, first with threats and then with beatings. In the midst of legal proceedings before the Bishop of Assisi, Francis renounced his father and his patrimony, laying aside even the clothes he had received from him in front of the public. For the next two years he lived as a beggar in the region of Assisi. 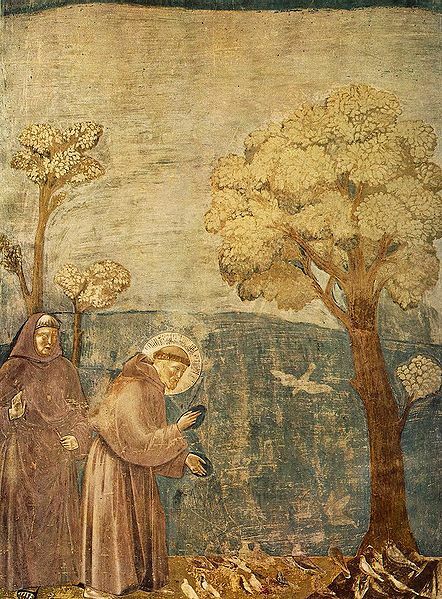 He embraced the life of a penitent, during which time he restored several ruined chapels in the countryside around Assisi, among them the Porziuncola, the little chapel of St. Mary of the Angels just outside the town, later to become his favorite sanctuary and home base of the Franciscan Order. At the end of this period (on February 24, 1209, according to Jordan of Giano), Francis heard a sermon that changed his life forever. The sermon was about Matthew 10:9, in which Jesus tells his followers they should go forth and proclaim that the Kingdom of Heaven was upon them, that they should take no money with them, nor even a walking stick or shoes for the road. Francis was inspired to devote himself to a life of poverty. Clothed in a rough garment, barefoot, and without staff or money, he began to preach repentance. He was soon joined by his first follower, a prominent fellow townsman, the jurist Bernardo di Quintavalle, who contributed all that he had to the work. Within a year Francis had eleven followers. Francis chose never to be ordained a priest and the community lived as fratres minors, “lesser brothers.” The brothers lived a simple life in the deserted lazar house of Rivo Torto near Assisi; but they spent much of their time wandering through the mountainous districts of Umbria, always cheerful and full of songs, making a deep impression upon people around them. Francis’ preaching to ordinary people was controversial since he had no license to do so. In 1209 he composed a simple rule for his followers , the Regula Primitiva or “Primitive Rule” which came from verses in the Bible. The most basic rule was “To follow the teachings of our Lord Jesus Christ and to walk in his footsteps.” In the same year, Francis led his first eleven followers to Rome to seek permission from Pope Innocent III to found a new religious Order. 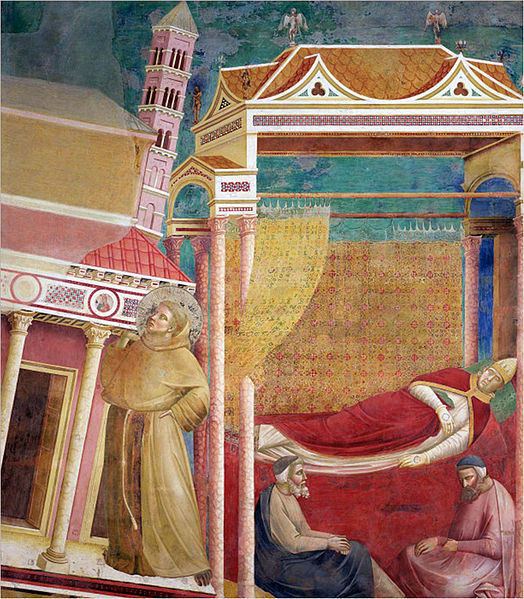 Upon entry to Rome, the brothers encountered Bishop Guido of Assisi, who had in his company Giovanni di San Paolo, the Cardinal Bishop of Sabina. The Cardinal, who was the confessor of Pope Innocent III, was immediately sympathetic to Francis and agreed to represent Francis to the pope. Reluctantly, Pope Innocent agreed to meet with Francis and the brothers the next day. After several days, the pope agreed to admit the group informally to the church as an Order, adding that when God increased the group in grace and number, they could return for an official admittance. The group was then tonsured. This was important in part because it recognized Church authority and prevented his following from possible accusations of heresy. Though Pope Innocent initially had his doubts, following a dream in which he saw Francis holding up the Basilica of St. John Lateran (the cathedral of Rome and, therefore symbolic of the church as a whole), he decided to endorse Francis’ Order. 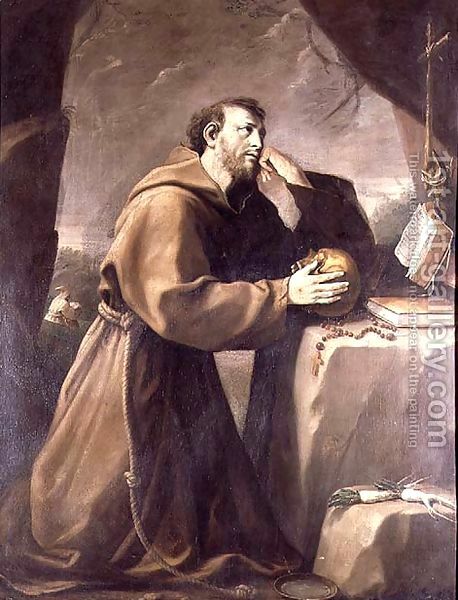 This occurred, according to tradition, on April 16, 1210, and constituted the official founding of the Franciscan Order. The group preached on the streets and had no possessions, relying on alms. Their first home was the Porziuncola, and they preached first in Umbria, before expanding throughout Italy. I’ll let you continue to dig if you want to know more – his founding of the Poor Clares, his missionary travels, the expansion and reorganization of the Order, the stigmata, his sermon to the birds, his attempt to bridge Christianity and Islam. Instead I will focus on his hymn of praise known in English as “The Canticle of the Sun,” in my estimation one of the greatest religious songs of all time (and my late wife’s personal favorite). Francis wrote this canticle in the Umbrian dialect of Italian but it has since been translated into many languages. It is believed to be among the first works of literature, if not the first, written in the Italian language. The canticle speaks of “mother earth,” “sister moon,” “brother fire,” and so forth. In essence Francis, following the theology of Genesis, asserts the unity of all of creation as a family: sun, moon, stars, wind, clouds, rain, animals, plants, earth, and humans are all related as God’s creatures, and, as such, should strive always to be in harmony. Perhaps in this sense Francis was the first ecologist, and first environmentalist. Francis is said to have composed most of the canticle in late 1224 while recovering from an illness at San Damiano, in a small cottage that had been built for him by Saint Clare and other women of her order. According to tradition, the first time it was sung in its entirety was by Francis and Brothers Angelo and Leo, two of his original companions, on Francis’ deathbed, the final verse praising “Sister Death” having been added only a few minutes before. The canticle was paraphrased as an English hymn by William Draper for a children’s festival in England as “All Creatures of Our God and King,” set to a 17th century German tune Lasst Uns Erfreuen, Ausserlesene Catholische Geistliche Kirchengesäng by Peter von Brachel, with harmony by English composer Ralph Vaughan Williams. Here is an abbreviated version. Sadly, it is now rarely performed in its entirety. In honor of St Francis here is an Umbrian vegetable soup. Francis was, of course, famously vegetarian. Minus the cheese this soup would also be vegan. “Agliata” refers to the garlic and herb mix which forms the base of the soup. Versions are known from medieval sources. Place half the basil, 2 tablespoons of oil, parsley, garlic, and onions in a food processor or blender and process until slightly chunky. Do not blend all the way to a paste. Heat the remaining oil in an 8-qt. pot over medium-high heat and add herb–garlic mixture. Cook, stirring often, until no liquid remains, about 5 minutes. Add the potatoes, celery, carrots, and tomatoes. Cook, stirring often, until the vegetables are golden brown, about 6 minutes. Add salt to taste and 4 cups of water (or vegetable stock) and bring to a boil. Reduce the heat to medium-low, cover and cook, stirring occasionally, until the vegetables are tender, about 20 minutes. Stir in the spinach, beans, peas, and endive and cook until the greens are wilted and just tender, about 10 minutes. Season with salt and freshly ground black pepper to taste and stir in the remaining basil. Serve in individual bowls and pass grated cheese and extra virgin olive oil for guests to add as they wish.